It's been a real challenge feeding my little one since the beginning. I spoon-fed her purees, then semi-solid, and now solid food. She doesn't seem to ever enjoy food and I only have myself to blame. Maybe I didn't do it right, maybe I fed her food too early when she wasn't ready, and maybe I "forced" her to eat and she's associated food as something negative. She would shut her mouth, turned her face away, pusedh the spoon, the food, or my hands away, she'd cry, she didn't want to sit on her booster seat to eat, and so on. It always ended up with me being so frustrated and baby melt-downs. I knew about baby-led weaning and tried it for a while, but I just wasn't patient enough to see all the food thrown on the floor and her eating so little worried me. When she was able to spoon-feed herself at around fifteen months, I gave her independence to eat on her own only to find that all she wanted was just the plain carb (rice, noodles, or pasta) and nothing else. So I thought it couldn't work that way, she needs much more nutrients than that for her growing body. It was back to spoon-feeding her. Every meal time was a battle which took one to two hours each time. Being someone who is passionate about giving the best nutritionally to her family, especially her little one, this feeding issue is very frustrating. It was hard to see that she doesn't like anything but plain carb (I was already so thankful she likes fruits). I even wished that only if she likes eggs, I would be more than happy. Pastured eggs (eggs that do not come from chicken raised in confinement) are very nutritious. It's considered a brain food and supplies almost all nutrients that the body needs. I tried many ways to cook the egg and she had no interest. One day I just decided this was it, I had to find another way because I didn't want the effects of mealtimes to take the joy of motherhood away (because honestly it was affecting me in a negative way!). And I re-considered the "baby-led weaning" approach again for lunch and dinner, i.e. 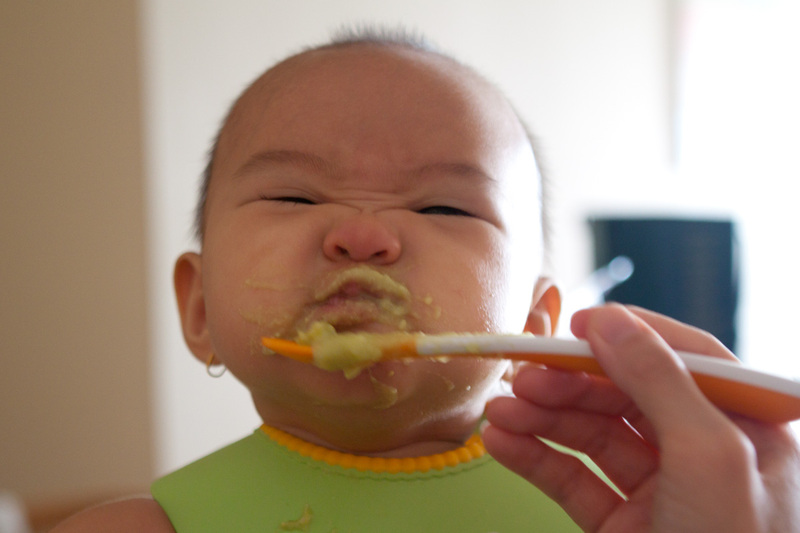 letting the baby eat on her own, at her own pace. So this what I did to give her a more well-rounded meal. 1. Vitamins. I steam a variety of vegetables and cut them into cube sizes. Place them in a nice jelly mold and fun picks from Daiso (two-dollar store). 2. Protein. I found a way to make her eat her eggs! I cook the egg with coconut oil, a bit of unrefined salt, and green onions, cut them into small sizes, and call it "snack!" I'd give her the egg first before her veggies and she doesn't mind eating it this way. I also give her cooked kidney beans along with the other vegetables for additional protein and fiber. As for meat, so far she only likes to eat chicken apple patties. 3. Carbohydrates. I know she likes rice and she can spoon-fed herself, so sometimes I cook her (brown) rice in homemade broth to make it more nutritious and sometimes combine it with fermented tempeh for more protein. She doesn't like tempeh just as is, but she doesn't notice it when I mix it with her rice because they look the same (hah!). 4. Fats. In addition to the fermented cod liver oil and coconut oil that she consumes every morning (and also the coconut oil used to cook her egg), I add a little pastured butter in her vegetables or soup. You body can better absorb the vitamin A in your food if you add butter (or other fats), so I add it to foods such as carrots, pumpkins, and butternut squash. 5. Soup. I spoon-fed her whatever soup we are having (she likes salmon miso soup) or just plain homemade broth, as much (or as little) as she likes. 6. Dessert. She doesn't eat much dessert other than fresh fruits, but occasionally I make palm sugar jelly and fruits' popsicles. So it's not yet a perfect diet and it still takes her a while to finish her food sometimes, but it is a major improvement from how I see it because it makes mealtimes much more peaceful for both of us. Sometimes she eats more, sometimes she eats less, but for the most part, she eats more than before. I hope this way works in the long term. Do you have any advice or ways that work to make the little ones eat and make mealtimes more peaceful?